Loaf Cake Mrs. Morris. No. 4. 1 pint milk 1 & 1/2 quarts flour 1/2 cup yeast 1 & 1/2 cups butter 3 cups sugar 2 eggs 1 teaspoon soda - mix milk flour & yeast together with half the butter & sugar, stirred to a cream - then let it rise, & mix in the rest of the butter & sugar, eggs & soda cinnamon & raisins - let it rise again, then bake. Loaf Cake, Mrs. Marsh. No. 5. 1 pint milk 1 & 1/3 quarts flour 1 & 1/2 cups butter 1/2 cup yeast 3 cups sugar 2 eggs. 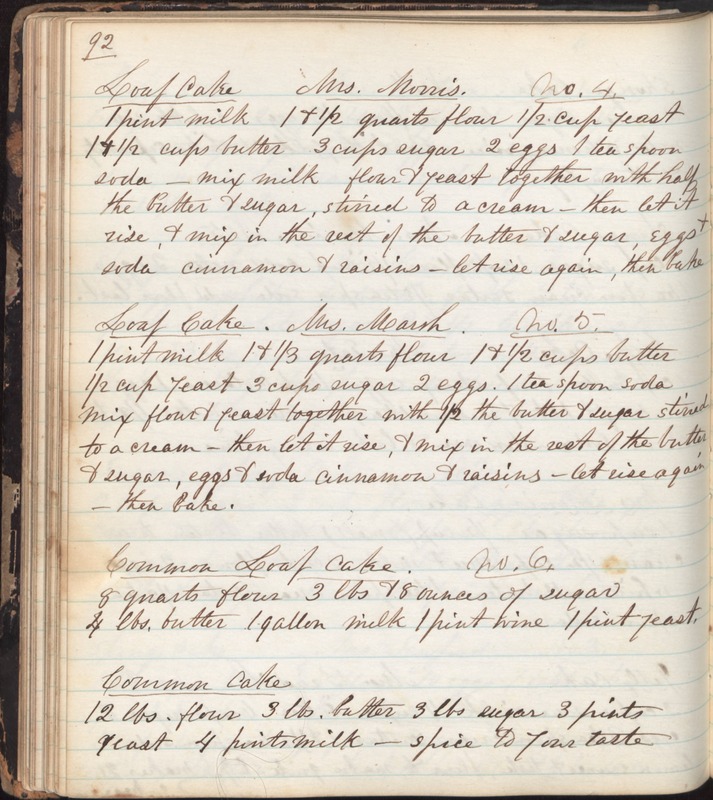 1 tea spoon soda mix flour & yeast together with 1/2 the butter & sugar stirred to a cream - then let it rise, & mix in the rest of the butter & sugar, eggs & soda cinnamon & raisins - let rise again - then bake. Common Loaf Cake. No. 6. 8 quarts flour 3 lbs & 8 ounces of sugar 4 lbs. butter 1 gallon milk 1 pint wine 1 pint yeast. Common Cake 12 lbs. flour 3 lbs. butter 3 lbs. sugar 3 pints yeast 4 pints milk - spice to your taste.